The scalp is the soft tissue layers covering the bone of the vault of the skull. It consists of a thin sheet of muscle, the epicranius, a layer of connective tissue richly supplied with blood vessels, and the skin. Typically the scalp is covered with hair. Hair is simple in structure and is made of a tough protein called keratin. A hair follicle anchors each hair into the skin. The hair bulb forms the base of the hair follicle. In the hair bulb, living cells divide and grow to build the soft shaft. Blood vessels nourish the cells in the hair bulb, and deliver hormones that modify hair growth and structure at different times in life. Hair grows at different rates in different people, with the average rate at one-half inch per month. Hair color is created by pigment cells producing melanin in the hair follicle. With aging, pigment cells die and hair turns gray. 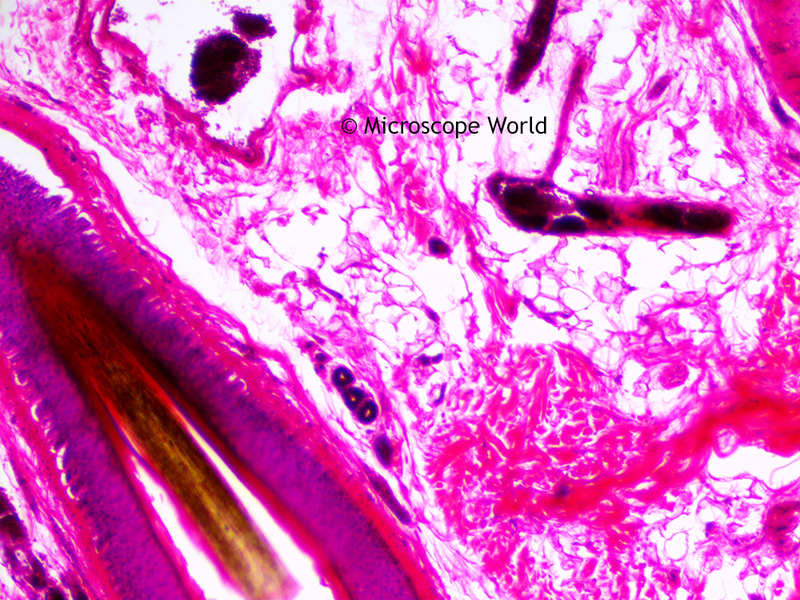 The images of scalp with hair (cross sections) were captured using the Fein Optic RB30 microscope and a 5mp microscope camera. Hair and scalp c.s. 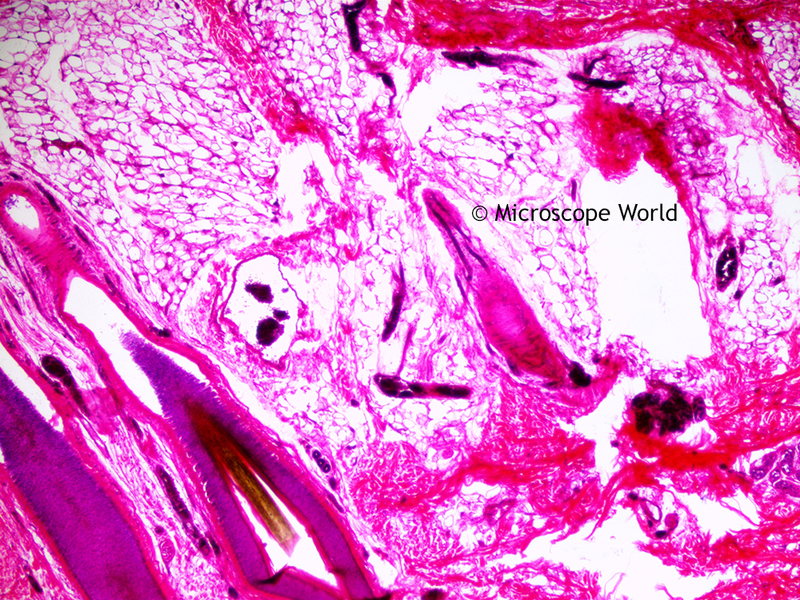 captured under the microscope at 40x. Hair and scalp c.s. captured under the microscope at 100x. Hair and scalp c.s. captured under the microscope at 400x. 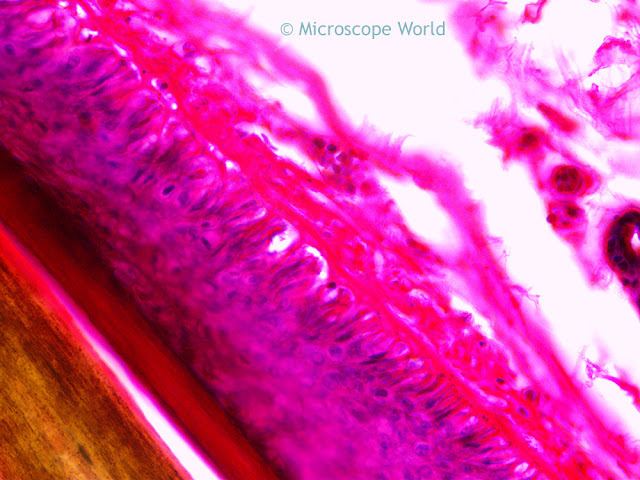 For more info on microscopes and digital microscopy cameras contact Microscope World.